Another post, another chance to point to Lay the Table and show off a different recipe than the one Becs used. This time it’s for big fat nommery Chocolate Orange Cupcakes. The cake mix is a fairly standard mix, with a bit of good quality cocoa powder thrown in. On top of that you have a nice fruity orange sugar syrup, all topped off with some zesty orange frosting. Takes a couple of hours all told, ideally with a day in the middle. 20 minutes cooking time for the cakes. These ingredients make 12 normal sized cupcakes or 24 little ones. The grated zest of two oranges. Add the cream cheese, and mix this in too. Grate the zest of two oranges and, you guessed it, add this into the mix as well! Don’t chuck the oranges though – you’ll need one of them for the syrup. Juice one of the oranges you had left over from the frosting. Bring the orange juice and sugar to the boil, stirring to dissolve the sugar. Let the syrup cool, and then stir in the Cointreau (or other orange liqueur if you prefer). Yes, this means there will be a tiny bit of alcohol in your cakes. If you’d prefer there not to be, just add another tablespoon of orange juice instead at this point. Leave to infuse overnight if at all possible to let all the lovely flavours intermingle. If you can’t wait, then start making the cupcakes now instead. Lightly beat the eggs, and slowly add them to the mix – combine on a medium speed. Once the sugar, butter and eggs are combined, mix in the flour and cocoa powder at a low speed. That’s your cake mix – nice and simple. 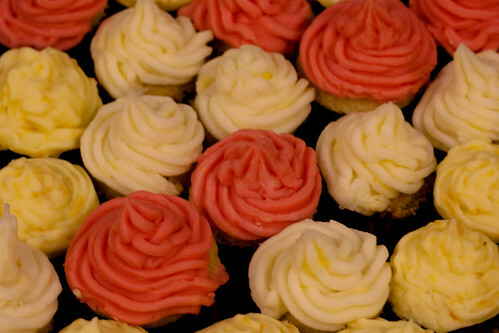 Put your mix into your cupcake cases, and from there into the oven for 18-20 minutes. I use a children’s plastic icing plunger to place my cake mix into cases. I find this is much easier than using spoons, and quicker than using a proper icing bag (which is use for the proper icing). Once the cakes have cooked, leave them to cool for ten minutes if you’re making normal cupcakes, or five minutes if you’re making mini ones. Prick the top of the cupcakes a few times with something pointy like a cocktail stick, and using a pastry brush coat the tops with the sugar syrup. Be careful not to splash syrup everywhere, but also remember that the syrup is fantastic and will keep the cakes lovely and moist and add flavour so don’t be stingy. Don’t be worried if you have a load of syrup left though – that’s normal. Once completely cooled, you can ice the cakes using your preferred method. Finally, eat the damn cakes! Thanks for posting the recipe. Those sound tasty, will be giving them a go this weekend. Nice work – I love the tag line! I’m going to make these for a womens’ networing event but top them with a pumpkin decoration for Halloween!